If you were not in a coma in 2017, you probably heard about the film Wonder Woman. Not only did it kill it at the box office, scores and scores of people passionately resonated with the story itself. The acting was stellar (especially by Gal Gadot and Chris Pine), the action was as good as it gets, there were unexpected twists, the score was moving, and personally it was my favorite movie of the year. But this isn't a movie review. So why am I writing about Wonder Woman. Wonder Woman resembles Jesus A LOT! So much of how Wonder Woman is portrayed, what she does and accomplishes, and the means by which she saves the world reminds me of the greatest hero. Let's take a look and see Wonder Woman as a Christ figure. As a child of God, Diana leaves her home in paradise to save humanity from the war that will end all wars, an unwinnable war that is consuming the whole world. Humanity believes they can win this war and Diana's companions even try and keep her on the sidelines numerous times. Throughout salvation history, mankind either believes it doesn't need God or thinks that it can win the war by themselves (through human effort, hard work, bloodlines, sacrifices, etc.). Even when Jesus arrives, his own disciples continually try to keep him from his mission of dying on the cross and rising from the grave (see John 18:10-11, Matthew 16:21-28, Luke 22:47-51). On her way to defeating humanity's greatest enemies, she demonstrates compassion, generosity, and kindness with those who're hurting and suffering. This describes Jesus' earthly ministry. He ate with the poor, befriended the friendless, touched the untouchables, gave to the hungry and thirsty, and showed unheard of kindness and compassion. And at the same time she is strong, brave, and sacrificial, defeating a seemingly undefeatable enemy. Even though he knew the betrayal, abandonment, anguish, torture, suffering, and murder he would soon endure, Jesus intentionally chose the cross in order to defeat the undefeatable enemies of Satan, sin, and death (2 Timothy 1:10, Hebrews 2:14). Ares, the god of war, the ultimate enemy of humanity, describes the reality of the war. He cannot force humans to do evil but rather whispers evil and temptations and the humans do the rest. Ares' description of the human condition, that even in our nature we're sinful, is spot on. Our hearts and minds are poisoned with our sinful nature. We're not inherently good and just controlled by Satan but rather we're slaves to our own sin and influenced and enticed by his temptations (Mark 7:21-23, Jeremiah 17:9, Colossians 1:21). Mankind does not deserve redemption. They do not deserve the both innocent and divine Diana. But they are redeemable. There still is hope. What we actually deserve is death. But instead we get the innocent Christ and his offer of hope. He offers redemption through his blood. 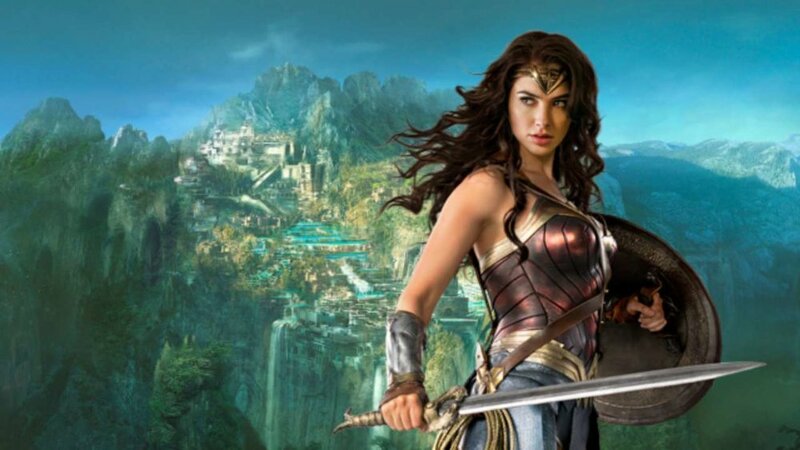 Filled with love and compassion for humanity, Wonder Woman defeats Ares. In her final blow that once and for all crushes Ares, she is lifted high in the air, spreading her arms wide. On the cross, Jesus' arms spread wide and filled with love and compassion for humanity, Jesus defeated Satan! "The reason the Son of God appeared was to destroy the works of the devil" (1 John 3:8). So go home and watch Wonder Woman. And when you're deeply moved by the film and character, see a shadow of the ultimate hero. Let the imperfect yet close example of Christ lead you to understand, feel, and champion the gospel. Let this film, and others like it, point you to the true and better hero who didn't just risk his life for the weak, suffering, and powerless but actually gave his life so that they might truly and fully live!